You will quickly notice that Caraquenos (residents of Caracas) have a great sense of style. They love to shop for the latest things and have plenty of massive glittering shopping malls to do it in. Jewellery, gold and leather items like shoes and handbags are very good purchases in this city. Prices are, however, not shockingly low, and so you won't find much in the way of a deal. That said, Caracas has some of South America's nicest shopping malls, and so it is always an interesting and entertaining experience to go shopping here. One area of shopping that isn't quite as inspiring as other Latin American cities is the markets. 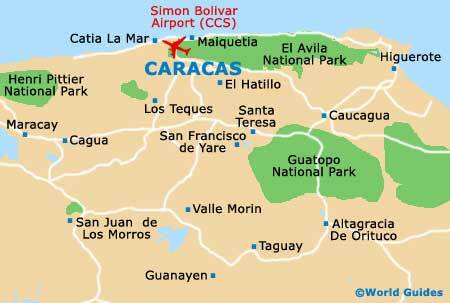 Caracas doesn't have colourful, bustling local markets where you can enjoy a cultural experience. They are often unsafe and not particularly interesting, although the Mercado Guajiro on the Plaza Chacaito is a reasonable choice. Head to El Hatillo, just south of the city, if you want to enjoy an afternoon hunting for handicrafts. This charming little town really is a great place to shop for everything from handmade devil masks to traditional ceramics at the huge indoor Hannsi Centro Artesanal. The most gigantic shopping complex in Caracas is the Centro Comercial Sambil off the Avenida Libertador, which is advertised as being the biggest in South America. This mall has five levels and is hugely popular with the locals. You will find a multiplex cinema, miniature amusement park, performing arts centre and gourmet restaurants. Other decent malls in the city include the Centro Comercial El Recreo in Sabana Grande - on the Avenida Casanova, the Centro San Ignacio on the Avenida Blandin, and Tamanaco off the Autopista Caracas Baruta. Shops in the malls are typically open everyday from 09:00 to 19:00. Check out the Las Mercedes district for the most upscale galleries, shops, nightclubs and restaurants. This is where affluent locals like to go and shop, and it truly is one of the safer and quieter parts of Caracas. Its upmarket Centro Comercial El Tolon and Centro Comercial Paseo Las Mercedes shopping malls have a great selection of boutique outlets, with both being located along the Avenida Principal de las Mercedes. Altamira is another posh neighbourhood with an enticing choice of stores.